Researchers and clinicians believe there are multiple causes and need multidisciplinary and comprehensive approach for the diagnosis and treatment. "The Main Cause of TMJ disorder is Dental Malocclusion"
The TMJ position is dictated by the way the upper and lower teeth meet together (occlusion). If the bite lost its physiologically functional position (malocclusion), it will displace the TMJ from its homeostatic position: which is the TMJ disorder. DENTAL MALOCCLUSION (BAD BITE) is the result of many causes: deep bite, missing molar teeth, multiple missing teeth, poorly aligned teeth, crooked teeth, under development of dental arch, badly decayed or broken teeth, excessively worn down teeth, loose teeth, poor dental work, poor orthodontic treatment, grinding teeth (habitual or stress), habitual wrong position, major surgery, injury, accident, etc. Dr. Kim developed a unique diagnosis and treatment technique: The Neuromuscular Splint Technique. The effect of this technique is phenomena: simple and accurate diagnostic method, TMJ symptoms, which exhibited in over 90% of the patients who visit the office can be treated within 2-4 months. 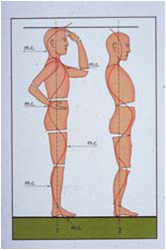 The following are common symptoms which can be alleviated or relieved with Neuromuscular Splint Technique. Chronic headaches are the number one pain problem in the United States. The pain mechanisms of headaches is well researched and established, state of the art diagnostic equipment are invented, numerous medications are developed, various treatment protocols are established and there are thousands of healthcare practitioners who devote their practices to headaches. However, millions of people still continue to suffer from various types of headaches everyday without knowing when the pain will cease, what else to do, and hoping that pain will go away some day. "Are headaches really an incurable disease?" An American Medical Association study illustrates that neck muscle contraction comprise about 90% of all headaches and the distraction of the occipital nerves, which originate from the back of the neck and spread to the head, are the most common nerves to cause headaches. We move our jaw over 2000 times a day (and night): every time we chew, talk, swallow or move our head, neck, teeth come together, and brace the jaw against the skull. If someone has dental malocclusion, it can displace the TMJ from its balanced position and strain the occipital nerves and muscles. When the occipital nerves and muscles receive continuous tension beyond their adaptive capacity, headaches and migraine can be developed. At TMJ, Head & Neck Pain Center, hundreds of chronic headache patients, who did not respond to pharmacological management, physical therapy, and other comprehensive treatment are relieved from their chronic headache in 2-4 months after the Neuromuscular Splint Technique is applied. "Chronic Headaches and Migraine are no longer an Incurable Disease"
In dentistry, among the TMJ-dentists, it has been a well known fact that the main cause of neck pain is TMJ disorder. When the TMJ components are displaced due to any cause, the jaw and neck muscles become distracted, compress or injure the occipital nerves, which manifest as the neck pain. At TMJ, Head & Neck Pain Center, most of patients are relieved from their chronic neck pain after treating with Neuromuscular Splint Technique. Clicking, popping, and grating is the sound of abnormal movement of the condyle and disc in the socket and a typical sign of the 'Internal Derangement of the TMJ', and accompany various other symptoms: jaw pain, limited mouth opening, pain when chewing, bite feels off, earache, ringing in the ear, and loss of balance. If the vertical dimension of occlusion is properly established and the occlusion is balanced, these symptoms will be diminished right away, and other internal derangement symptoms will be alleviated or relieved. The Neuromuscular Splint Technique is the treatment of choice. Numerous research papers are published as to the relationship between TMJ disorders and ear related symptoms. The TMJ condyle is located in front of the ear hole; separated by a thin bone plate. If the TMJ is displaced and vertical dimension is lowered, it may irritate and compress the ear hole and cause various symptoms such as: ear ache, ringing in the ear, dizziness or vertigo, loss of balance, etc. These symptoms can be relieved by creating a proper space between the condyle and tympanic membrane by raising vertical dimension and re-positioning the TMJ in a physiologically balanced position. The Neuromuscular Splint Technique can relieve or improve these symptoms. Trigeminal neuralgia is also referred to as "tic douloureux". The symptoms are: unbearable painful twitch and sharp, short electric-type pain. Pain is triggered by touching a specific area of the skin by washing, shaving, applying makeup, brushing the teeth, kissing or even by cold air. The main nerves distributed in the face and the jaw are the Trigeminal nerve and the Facial nerve. When these nerves are irritated, compressed or damaged, it manifests as Trigeminal neuralgia, facial pain or facial muscle twitching. Commonly, drugs such as neurontin, tegretol or injections are used to quiet the nerves. Occasionally, very aggressive treatment modalities are applied, such as brain surgery, to separate the blood vessel from nerves to relieve pressure to the trigeminal nerve. According to Dr. Kim's clinical experience and research, the main cause of Trigeminal neuralgia is the irritation or damage of the Trigeminal nerve and Facial nerve, mainly due to the dental malocclusion, TMJ disorder or injury. Dr. Kim was able to treat number of trigeminal neuralgia patients by utilizing "The Neuromuscular Splint Technique", without medication or surgery. This is one of the most prevalent rheumatic disorders affecting women between the ages of 25 and 55. Most FM patients complain of generalized pain that is difficult to pinpoint which leads to the statement: "It hurts all over" (11 out of 18 pain points). Hundreds of prominent researchers and clinicians have spent their time and effort to find the cause of FM and its pain mechanisms. So far, they have recognized the following as possible causes of fibromyalgia: physical trauma, arthritis, chronic mechanical stress, psychological distress, significant emotional stress, automobile accident, infection, sleep deprivation, depression, anxiety, childhood trauma, irritable bowel syndrome, headaches (migraine, tension type), temporomandibular pain and dysfunction, myofascial pain syndrome, chronic fatigue syndrome, female urethral syndrome, nutritional deficiencies, hormone imbalances, sensitive central nervous system caused by continuous irritation of chemical, heat, touch etc. "Wow! Who could possibly not have Fibromyalgia? " "Fibromyalgia Experts" have recommended the following treatment/management modalities: exercise, muscle strengthening, aerobic fitness, pool exercise, spa therapy, ultrasound therapy, cardiovascular program, mineral bath, acupuncture, massage, nutritional supplement, chiropractic therapy, physical therapy, pain pills, muscle relaxants, and sleeping pills. Also large pharmaceutical companies are engaged in a race to discover effective drugs for treatment; you may soon be bombarded with 'new drugs'. Are you going to visit every specialist or are you going to have a shot at every pain site one after another? Or, will you join a "Fibromyalgia Support Group" and sympathize with others in their unfortunate situation and learn how to live with it? At TMJ, Head & Neck Pain Center, Dr. Kim consider the Fibromyalgia as one of the TMJ disorder symptoms and treat as usual. If the Neuromuscular Splint Technique is accurately applied, it lower the nerve proprioceptive and alleviate pain without medication, painful stretching exercises or unfavorable invasive treatment. Whiplash trauma is the result of a vehicular collision or other jarring event (such as a fall). 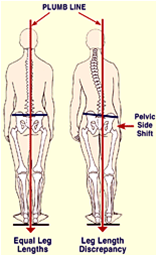 Neck pain is the most commonly reported symptom, headache and upper shoulder girdle pain is the second. 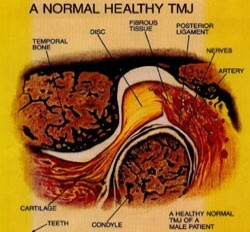 If symptoms are not relieved after suggested therapies, there can be a bite change and displacement of the TM joint as a result of the incident. In this case, symptoms may not be relieved until proper bite/TMJ relationship is rehabilitated. The Neuromuscular Splint Technique is the treatment of choice. Our body is an ultimate living machine, which can perform better than any living creature in the universe. 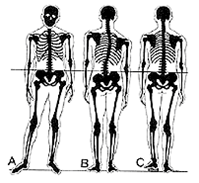 The musculoskeletal system is the thriving factor for you to enjoy golf, dancing, sports, work-out, sexual performance, and keep a balanced posture. Well aligned body structure, proper muscle tone, good quality nutrition, good night's sleep, and stress-free emotional environment are all essential factors for our peak performance. If you experience loss of balance, unstable gait, discomfort on standing and sitting, limited range of movement, head forward posture, need cane for walking, etc., you may have dental malocclusion and TMJ disorder. 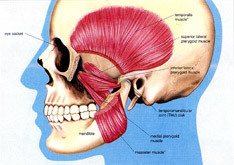 If found the TMJ disorder is the cause of symptoms, it can be treated by balancing the bite and rehabilitate TMJ in a physiological functional position. Dr, Kim have been helping these symptoms with The Neuromuscular Splint Technique: the balance and function improves greatly and the muscle pain alleviated or eliminates a great deal amount. If you have performance issue or pain without good reason, it will be worthy to have a consultation and evaluation with Dr. Kim.